This sparkly snowman is as happy as can be. 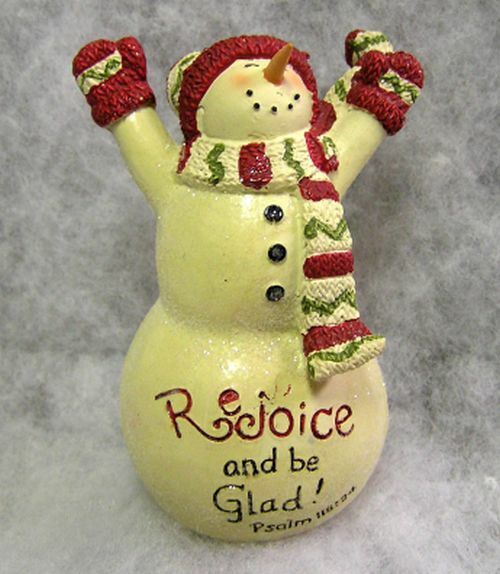 He has on a knit scarf, cap, and mittens and it says "Rejoice and be glad!". He measures 4 x 2 1/2 x 2 1/2. This hand painted design is unique to Manchester Cottage. 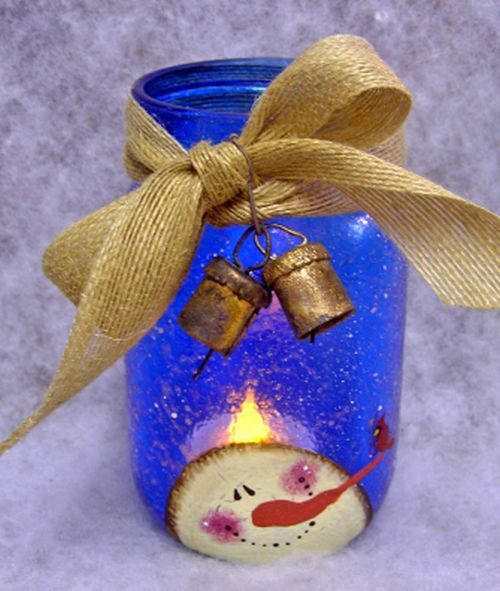 It features a glass jar with a special translucent finish, snowman head with cardinal, burlap bow and rusty bells, and a votive light inside. It measures 6 x 3. This unique votive quart glass jar has a dark sparkle finish with white flyspecking. 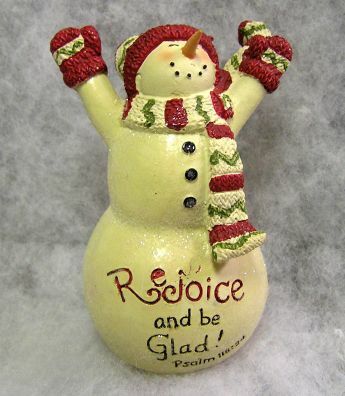 There is a hand painted snowman head at the bottom with a cardinal sitting on its nose. A silvery ribbon bow is tied at the top with a white snowflake. The votive is included. It measures 7 x 4 x 4. This LED candle features a hand painted snowman head. It uses 2 AA batteries. It measures 6 1/2 x 1 x 1. 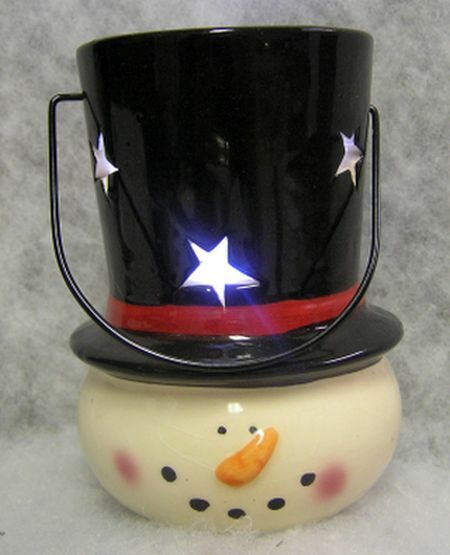 This ceramic snowman head features a black top hat with star cut outs that allow the light to shine through. He has a carrot nose, rosy cheeks, and a smiling mouth. It measures 4 1/2 x 3 x 3. This beautiful laser cut wooden snowflake has a jute hanger. In the center there is a wooden disk with bark on the outside and the disk is hand painted with a snowman face. It measures 8 1/2 x 8 1/2 x 1. This is a unique little resin snowman. 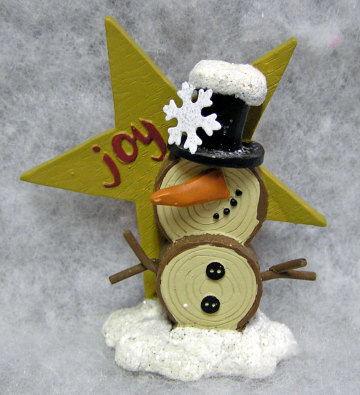 It has a star with the word "joy", a snowman that looks like it is made of wood slices, and stick look arms. He also has a tophat with snow and snowflake and is standing on a sparkly mound of snow. 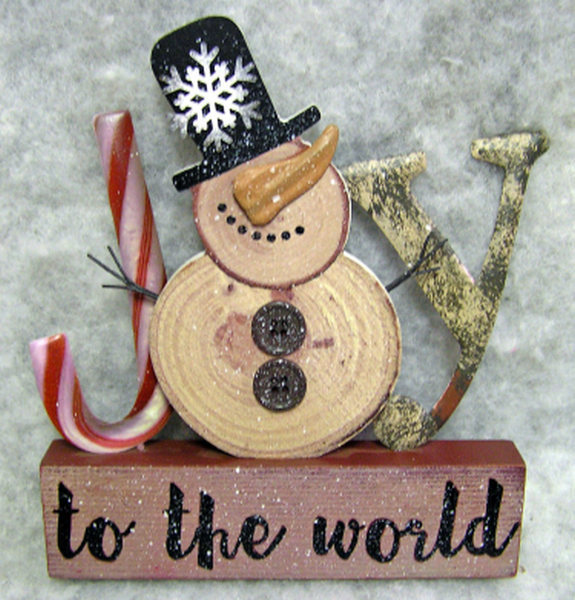 "JOY to the world" is the message of this snowman creation. 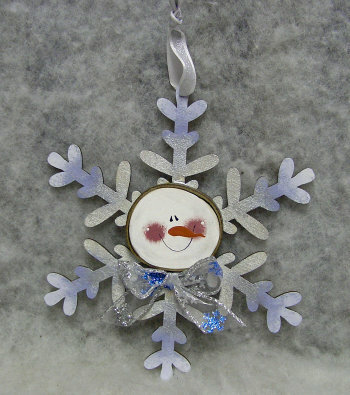 The snowman looks like wood slices and has a metal nose and wire arms, rusty tin snowflake on his hat, and buttons on his belly. He is mounted on a wooden base. It measures 8 x 7 1/2 x 1. 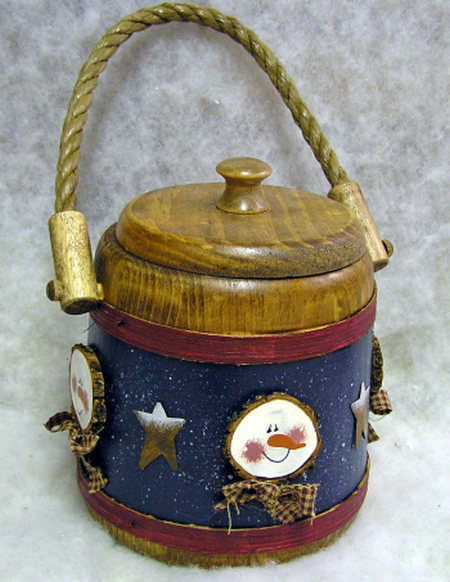 This unique Amish made wooden bucket features a rope handle and lid. 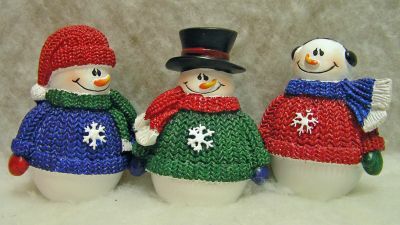 It is hand painted with a blue flyspecked background, four wooden snowmen heads with fabric bow, and rusty tin snowflakes. It measures 7 x 5 1/2 x 5 1/2. "B-E-L-I-E-V-E" is spelled out in this resin item. 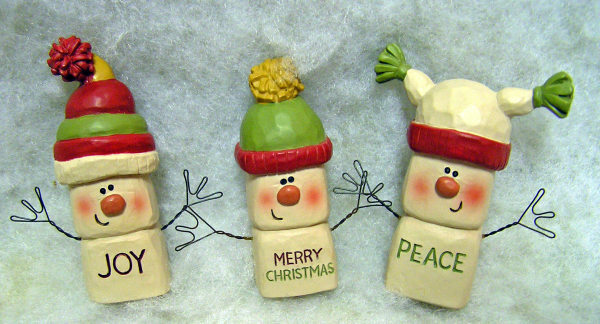 The letters are snow covered and there are 3 snowmen with wire arms and hats sitting around. This measures 2 1/2 x 8 x 1 1/2. 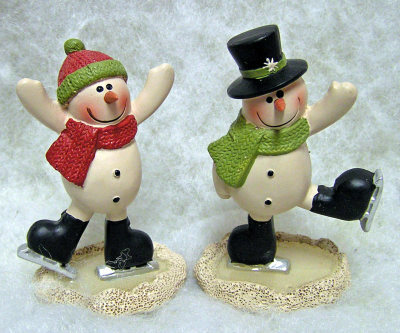 These cute resin snowmen are skating on an ice looking base. They come in two styles: Snowman with Snow Cap and Snowman with Top Hat. They both have hats and scarves and little black skates. They measure 3 1/4 x 2 1/4 x 1 1/2. 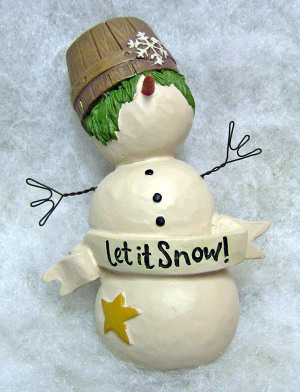 This resin snowman has a bucket on his head and a carrot nose. It says "Let it Snow" on a banner on his belly, and he has wire arms and a star. He measures 4 x 3 x 2. 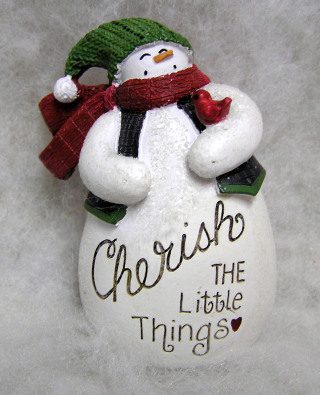 "Cherish The Little Things" is engraved on this ceramic snowman. He has on a knitted snowcap, scarf, and vest and there is a little bird sitting on his arm. He has a sparkle finish and carrot nose. He measures 3 1/2 x 2 x 1 1/2. 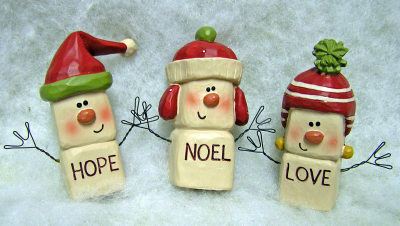 These cute resin marshmallow snowmen come in six styles: "Hope", "Noel", "Love" (shown) and "Joy", "Merry Christmas", "Peace" (click on photo to see these options). The words are engraved on their bellies and they have hats, smiles, and wire arms. They measure 3 x 2 1/2 x 1.